Weighing approximately 110 grams, bog turtle is the smallest species of turtle in North America. A mature male bog turtle has an average length of 3.7 inches while the female has an average length of 3.5 inches. The carapace is rectangular in shape and is narrower at the head and wider at the tail. The carapace has visible rings on the rough scales. The shell is black in color. The turtle’s skin is also black while the inside of the legs has an orange-red wash. It has a yellow spot on each side of its neck while the head is dark brown to black. The bog turtle has a life span of 40 years and is ideal for someone who is looking for a lifelong companion. The bog turtles derive their name from their habitat. They are found in bogs, acidic wetlands, alkaline wetlands and wet meadows. There are found in New York, Connecticut, Tennessee, Maryland, Virginia, Massachusetts, South and North Carolina. The bog turtle is semi-aquatic meaning that they can survive on both land and sea. They are not the best swimmers and only swims for short distances. They are heavy baskers just like most turtles. They bask to sustain their body temperature. Basking is a form of thermo-regulation that enables them to control metabolic processes. Bog turtles are omnivorous in nature and eat aquatic plants such as duckweed. They also eat snails, slugs, insects, earthworms, and other invertebrates. They occasional eat berries and seeds. Bog turtles generally enjoy eating insects and it is one of their most important foods. If you are keeping it as a pet, you can feed it using fruits, vegetables and meat such as chicken hearts, liver, and tinned dog food. You should also feed them with calcium supplements to strengthen their claws. They feed only during the day. They can be fed on land or in water. 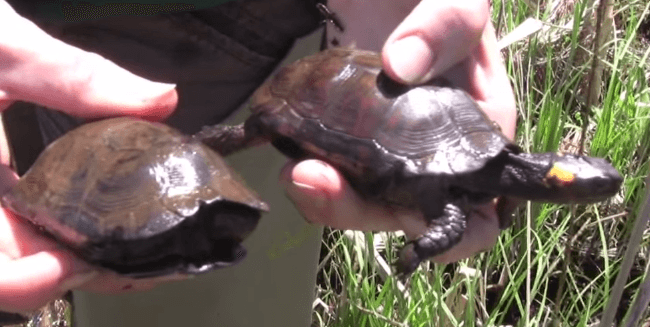 Bog turtles are preyed upon by carnivorous pets such as dogs, cats, and raccoons. Some parasitic flies plague upon these turtles which causes blood loss and weakness. Their shell offers little protection to these predators. They are also susceptible to bacterial infections which cause pneumonia. The turtle attains sexual maturity at the age of 5 to 8 years. Their breeding period is between late spring and early summer. Female bog turtles lay 2 to 3 eggs that hatch in late third quarter of the year. Basking helps these turtles to incubate their eggs. Hatchlings should be given special attention as they are week within the first three weeks. They should be kept in water with depth of less than 2 inches. Floating plants should be used to improve the survival chances of the turtle. The bog turtle is one of the turtle species that is facing extinction. If you currently own a bog turtle, give it proper care so that you can help preserve this fascinating turtle. This includes keeping it in correcting housing, environment, temperature, and correct nutrition, among others.